The genus Ixia consists of a number of cormous plants native to South Africa from the Iridaceae family and Ixioideae subfamily. Some of them are known as the corn lily. Some distinctive traits include sword-like leaves and long wiry stems with star-shaped flowers. It usually prefers well-drained soil. The popular corn lily has specific, not very intense fragrance. It is often visited by many insects such as bees. The Ixia are also used as ornamental plants and cut flowers. Ixia viridiflora, also known as "Turquoise Ixia", is a tall member of the genus Ixia. It comes from around the Tulbagh in South Africa, Cape Province. It has small corms under the ground. This corn lily is a very rare plant. Its habitats are often destroyed by human influence so the conservation status of this interesting flower is vulnerable and is tending to worse. The plant gets the name "Turquoise Ixia" from the really spectacular blue-green turquoise colour of the flowers, which is a rare colour for flowers. They are grouped in long inflorescences and are traditionally star-shaped like in most corn lilies. They have a black-purple centre. The ovary is 3-locular. This flower is pollinated by specific scarab beetles known as monkey beetles of the tribe Hopliini. 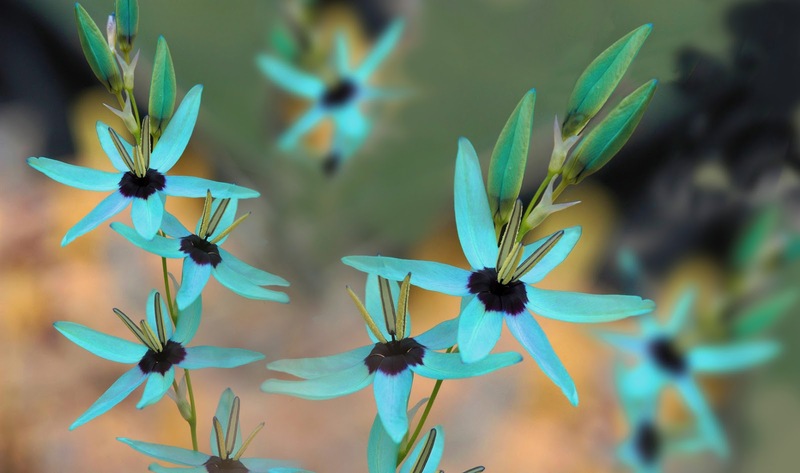 The Turquoise Ixia has very good ornamental traits with its beautiful inflorescences but is very rare in cultivation because of its conservation status. Beautiful little blue flower. I love the hue. I do not know this plant. She looks so tender and ethereal. What an unusual color! Fascinating! I've never seen this before - the color is indeed unique!